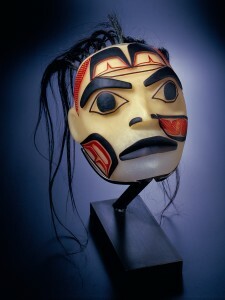 Preston Singletary, "Warrior Mask," mold-blown and sandcarved glass with horsehair, 2001, 14 x 10 x 7 in. Collection of Larry Gabriel. Image courtesy of the Anchorage Museum. One thing to love about the Anchorage Museum: its artists render beauty from some very… remarkable materials, like seal intestines, and walrus oosik. * Two new shows at the museum, solo exhibitions of the photography of Tim Remick and the glass works of Preston Singletary, don’t use remarkable body parts, but depict them. Tim Remick’s show, After: Portraits from Denali, includes photos of 23 climbers immediately upon their descent of Alaska’s Mt. McKinley, aka Denali, the highest peak in North America. Let me emphasize “immediately”; Remick intercepted these climbers as soon as they reached Base Camp on the mountain, before they showered, before they changed clothes — before they found a mirror, apparently. I have never seen a larger frostbitten nose in my life. Really remarkable. The portraits are not just hyper-large (four feet of face!) but hyper-high-def. You can see every pore, every whisker, every flake of dried skin, every peeling bit of chapped lip. Interestingly, the mountaineers’ expressions are almost uniformly gnarly and hardboiled. Ben Anderson of Alaska Dispatch surmises that the climbers were “too tired to smile” for their portraits, and the museum literature says almost the same thing, but I must admit that I found the tough-guy visage, well, a little affected. When I reached Base Camp on Denali, sure, I was exhausted and sunburnt and crusted with snot, but also exultant. The mood of almost every climber around me was euphoric, if not from the achievement than from the sudden surge of oxygen we were relishing in our veins after descending 13,000 feet. Really? No one wanted to smile? Across the hall is Preston Singletary’s singularly gorgeous exhibit, Echoes, Fire, and Shadows, which showcases works from 1985 to 2008, and his evolution from European style glass-blower to modern, global interpreter of traditional Tlingit art. 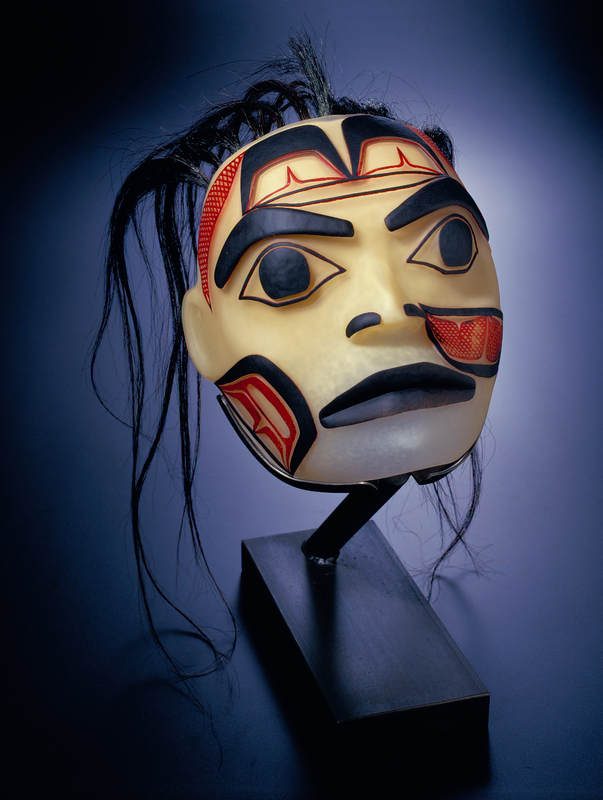 Singletary’s sculptures include a bentwood box, potlatch masks, a whaler’s hat, crest hats, amulets, a soulcatcher — all customary Tlingit forms, traditionally made from wood, bark, or root, except Singletary makes them of glass. And it’s stunning. Then there are the shaman rattles, which traditionally depict humans (and other creatures) on the backs of ravens, oystercatchers, and other birds. Out-stretched tongues link animal to human, symbolizing a transference of spirit. Singletary’s rattles are gorgeous, but I have never seen a longer tongue in my life — proportionally speaking, that is. The tongue on one rattle is as long as the human’s torso. Really remarkable, and provocative. I jest, mostly; the long tongue titillates, but that’s not the point. One point, I think, is to move “Native Art” out of the anthropological galleries and into the modern art galleries. These pieces aren’t relics or memorials of a static or disappearing culture, but contemporary sculptures with global influences. Singletary’s medium and genius makes these Tlingit forms, which have always looked graphic-like to me, even cleaner and more modern looking. Maybe the Anchorage Museum just has superb lighting, but the pieces seem to glow. My friend Gretchen and I inspected the two sculptures depicting the raven stealing the sun, trying to figure out if Singletary had inserted a little light bulb into the red suns to make them smolder so. The sandcarved “hats”, when lit from above, cast lovely shadows of wolves, faces, birds. This must be the other point of the show: that is, simply, beauty. Preston Singletary’s beautiful exhibit is on view through April 22. Don’t miss it. By the way, another thing to love about the Anchorage Museum: Their free days. Admission, normally $12 for adults, is free on the first Saturday of every month for Bank of America and Merrill Lynch card-holders, and for everyone on First Fridays from 6:00 to 9:00 pm. This coming First Friday (April 6), the museum will host live music by Melissa Bledsoe Fischer and live dance throughout the galleries by the Alaska Dance Theater. And admission is free for kids on April 21 and for everyone on May 6. One last thing to love about the Anchorage Museum: Their limeade. Honestly, the homemade limeade at the museum restaurant, Muse, is absolutely delicious. * An “oosik” is a baculum. Google it if you’re wondering.